When we think of learning how to make strudel, most of us are thinking about a German pastry; the most popular being apple strudel. Actually, this recipe has been tracked to Vienna, Austria. The origination of the strudel dates back to the seventeenth century. During the Austro Hungarian Empire in the eighteenth century, Hungary grew a lot of hard winter wheat which is very high in gluten. This wheat is what made it possible to make the thin flavorful dough (or stretched dough) which Austrian bakers used to make strudel. When you learn how to make strudel, you will find the dough is the most important part of this recipe. When you learn how to make strudel, you will also find there is a noticeable difference in the pastry dough from different countries. The traditional Austrian and Hungarian strudel dough is very elastic. As I mentioned earlier, the flour used is very high in gluten. It also contains salt, oil and water. After vigorously working the dough, letting it rest and then rolling, it can be stretched very thinly. “The thinner, the better” is the desire. 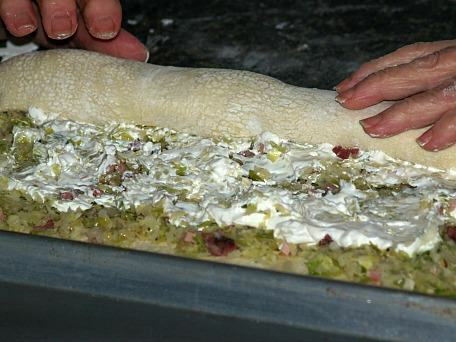 Similar to the Austrian and Hungarian strudel dough is the dough used in countries like Greece and Turkey. Perhaps you are already familiar with the commercially made type “phyllo dough”. This also is made with flour and water. Sometimes it has oil or white vinegar in the recipe and sometimes egg yolk. Oil and egg makes tougher dough but still tender and flaky after baking. Like the original dough, it is time consuming and vigorous work to accomplish the perfect results. After you learn how to make strudel with the previously described very thin dough, next learn how to combine it with a great filling. Whatever filling you choose, this very thin dough is wrapped in many layers around the filling. Most of the time the dough is brushed with melted butter or oil between layers making it very flaky after baking. When you learn how to make strudel, you will find many recipes which tell you to use “puff pastry”; usually a box purchased at the grocery. Puff pastry is used in many parts of Europe and quite often it is homemade. Here in the United States, it is recommended for most of the recipes I have seen. It is suggested that you simply buy a package from your grocery store’s freezer department. Puff pastry is made by rolling the dough, layering it with butter, folding it and then refrigerating until cold. This process is done from three to maybe ten times before wrapping a filling with it and baking. The result is delicious but I must add that it is much easier to purchase the commercially made puff pastry. Now, if you are learning how to make strudel, you need to decide what type of filling you want. The filling can be sweet or savory. The most popular strudel ever is apple strudel. You can use almost any type of fruit. Ones filled with custard, sweetened cheese or fruit with cheese are also very good. These can be served for breakfast, brunch, as a snack or dessert. 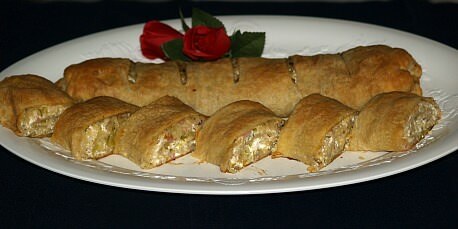 Lastly, let us not overlook the tasty savory strudels. These are often filled with chopped meats, vegetables and cheeses. Herbs and spices add a lot of flavor to these. People love having a savory strudel as a main meal for dinner, lunch and even breakfast. NOTE: Strudels are usually rolled up jelly roll style beginning on the long side. 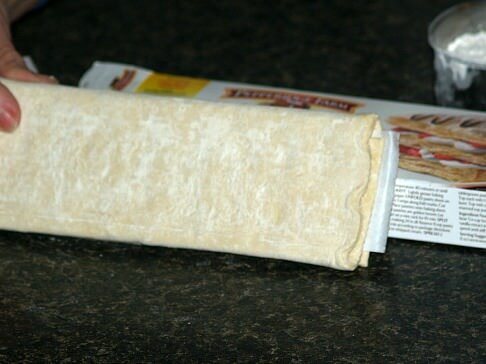 Learn how to make strudel using this easy strudel dough recipe. Begin a day before serving by combining in a bowl apricot, raspberry and strawberry preserves. Add lemon juice and tapioca; blend well, cover and chill overnight. NEXT DAY in 4 separate bowls put 1 ½ cups of flour, ¼ cup of oil and 2/3 cups of boiling water. Mix dough with a fork until well blended; roll EACH bowl of dough into a ball. Divide ONE ball into 3 equal parts; add ONE part to each of the REMAINING THREE parts. Divide each of the THREE balls into TWO equal parts (Making 6 balls of dough). On floured surface roll each ball to a 12 inch square (Keep surface floured). Spread a portion of preserve mixture on each of the 12 inch squares leaving 1 inch margin around edges. Sprinkle 1 cup of raisins and 1 cup of nuts on each square. Roll each square up pressing ends to seal and place on oiled 15X10x1 baking pan. Cut slits 1 inch apart across the strudel of each roll for steam vents. Bake for 20 minutes until golden brown; sprinkle with sugar cinnamon mixture. Cut warm strudels at steam vents and serve; serves 30 to 36. When learning how to make strudel use this dough with the apple rice filling below. Sift flour and salt into a mixing bowl; make well in center and add oil and water. Stir with a fork until well blended; knead on floured surface until smooth. Cover dough with a warm bowl and let stand for 30 minutes. Cover surface with tablecloth and dust with flour. 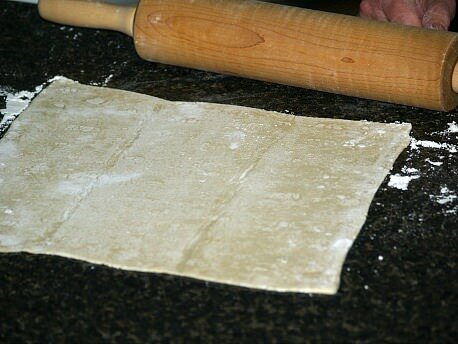 Put dough in center of cloth and roll as thin as possible (Be careful not to crack the dough). Make “fists” with your hands. Place the backs under the dough and gently stretch the dough until tissue paper thin. NOTE: Like stretching pizza dough BUT be careful not to tear this very thin dough. IF YOU DO TEAR, place one side of the tear over the other side sticking it together. You can brush tear lightly with drop of warm water. After rolling dough very thinly brush lightly with melted butter. Spread with a portion of the rice; then a portion of the apples. Sprinkle top with portion of the raisins and cinnamon. Drizzle with melted butter and sprinkle with sugar. Lift the tablecloth (End closest to you) rolling the dough over and over into a roll. After rolling bring ends together to form a ring; lift into a buttered casserole dish. NOTE: I use cake lifters for times like this; they work well. Brush top of rolls with melted butter; bake until well browned. NOTE: If strudel appears to dry during baking brush with melted butter. Learn how to make strudel dough with vinegar and egg included. Mix flour with salt in mixing bowl; add remaining ingredients and blend well. On lightly floured surface knead dough until smooth. Place dough on a clean lightly floured surface. Cover with warm bowl; let stand for 30 minutes. Cover surface with tablecloth; dust lightly with flour. 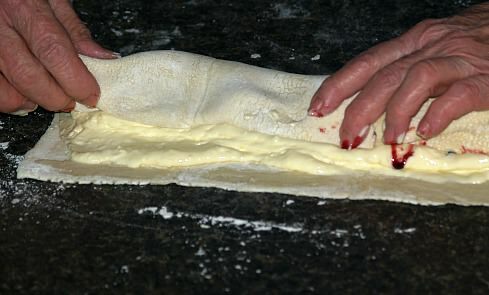 Place dough in center of cloth and roll as thinly as possible. With back of hands stretch rolled dough until very thin. Fill with APPLE RICE filling (recipe above) or your favorite filling. Learn how to make strudel using phyllo dough (Purchase from freezer department of grocery). Combine and mix in a large bowl the apples, breadcrumbs, lemon peel, sugar, cinnamon and nuts. Place 1 sheet of dough on flat surface; sprinkle with melted butter and top with another sheet of dough. NOTE: Keep dough covered with slightly damp towel. It dries out quickly. Repeat process until all sheets of dough are used; place apple mixture along one edge of dough. 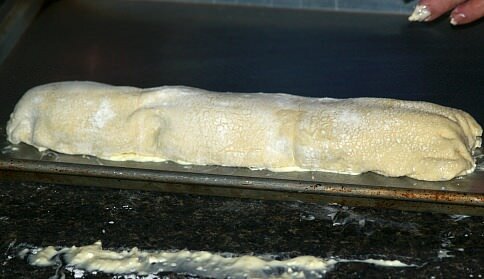 Roll up dough like “jelly roll”; transfer to a buttered baking sheet. Bake until crisp and golden brown; remove from oven a dust with powdered sugar. Slice diagonally and serve warm or at room temperature. 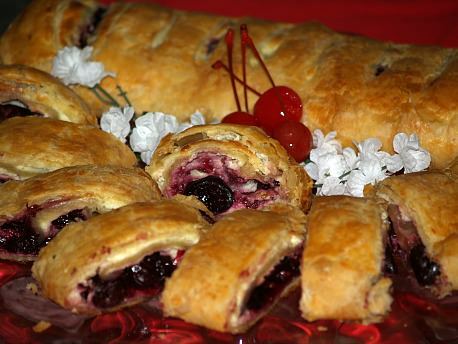 When learning how to make strudel, be sure to try some of the many savory recipes. Preheat oven to 425F degrees; grease baking sheet. Heat oil in a large skillet; cook onion until golden brown. Add beef and bell pepper and cook 5 minutes; add tomatoes and cook 5 minutes then cool. Stir in ketchup, Worcestershire sauce and seasoning. Roll out phyllo dough to a rectangle to 12X8 inches. Spread beef mixture over dough leaving a clear border. Scatter cheese over beef mixture; fold dough on short sides over the filling. Roll up from long side and seal; place strudel on baking sheet. Decorate the strudel with the dough trimmings; brush with beaten egg yolk. Bake for 20 minutes; REDUCE HEAT to 350F degrees and cook 20 minutes longer. 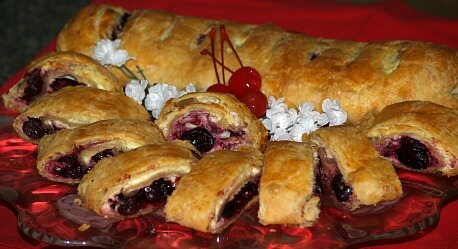 Learn how to make strudel the easy way with puff pastry filled with delicious cherries and cream cheese. Makes 2 strudels. Preheat oven to 375F degrees; lightly grease cookie baking sheet. Blend cornstarch with water until smooth. Combine cherries with the juice, ¼ cup of the sugar and cornstarch mixture in saucepan; cool. Beat cream cheese, eggs and ¼ cup of sugar until smooth and creamy. Roll half of dough to a rectangle 12X15 inches. Spread half of the cream cheese mixture over dough leaving a clean border. Using half of the cherry mixture make a single row nearest to you. 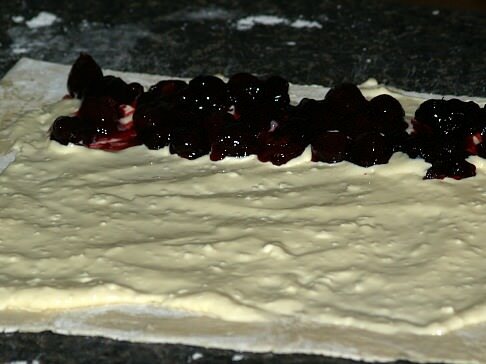 Fold dough over cherries and continue rolling jelly roll style. Make slits every 1 ½ to 2 inches for steam vents; place roll on prepared baking sheet. Bake 25 to 30 minutes until golden brown; cut in slits to serve. Learn how to make strudel for lunch or brunch. Preheat oven to 375F degrees. Lightly greased baking sheet. Salt cabbage; allow to stand while melting butter in skillet. Squeeze out excess moisture from cabbage; sauté cabbage over medium low until tender. 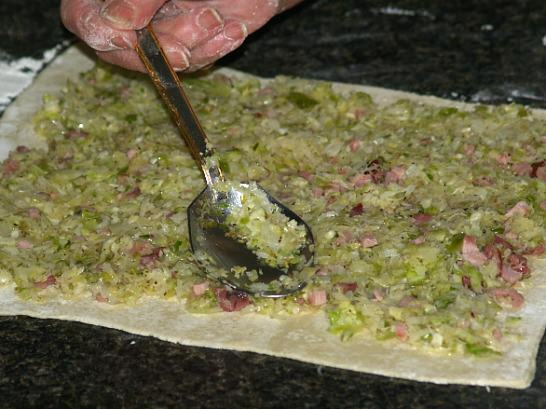 Stir ham into cabbage and cool; roll half of strudel dough to 12X15 inch rectangle. 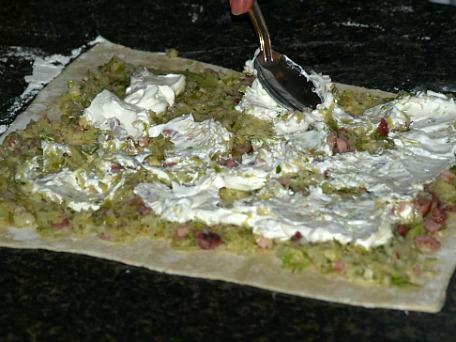 Spread half of cabbage mixture over rolled strudel dough; sprinkle cabbage with black pepper. Lightly spread half of sour cream over cabbage; roll up dough jelly roll style. Place on prepared baking sheet (Repeat with other half); bake about 45 minutes until browned.